Hundreds of thousands of Syrian refugees have defied border guards and razor wire to force their way into Europe. Large numbers have risked death on boat journeys across the Mediterranean to find safety. Turnbull has condemned those that cross borders and oceans, saying, “we will not tolerate people smuggling”. But the abhorrent conditions for refugees waiting in the region and the severely limited possibilities for resettlement through official channels mean asylum seekers have little choice. All those that come should be welcomed. The brutal civil war waged by Bashar al-Assad, the rise of Islamic State and both western and Russian bombs now falling on Syria are sure to force even greater numbers to flee. Already there are over seven million people internally displaced within Syria, and more than four million refugees in neighbouring countries like Jordan, Lebanon and Turkey. Despite the focus on Europe it is these countries worst hit by the crisis. One in five people living in Lebanon are now refugees after an influx of over one million people. Refugees are living in cramped and makeshift conditions in camps that will only get worse as winter starts. Imane lives in a tent with five others in a Jordanian refugee camp. She spends hours waiting in line for basic necessities like blankets and milk for her baby, often to be sent away when supplies run out. The camps are similarly stretched in Lebanon. Reports from Shatila, originally established for Palestinian refugees in 1949, say the camp only has electricity two hours a day and the tap water is full of salt. But the vast majority of displaced Syrians, in Jordan some 70 per cent, cannot fit in the camps and live in urban centers. The UNHCR and International Relief and Development found that two thirds of refugees in Jordan live below the poverty line and one in six live in abject poverty on less than $40 a month. Most refugees cannot work legally, leaving them open to extreme exploitation through illegal work. In Jordan they can be detained and deported for working without a permit. A 2012 study of Syrian refugees living in Jordan found that 80 per cent did not want to go to travel to any other country. Its proximity to Syria, family ties, shared history and culture, and the possibility to return home all contributed to this. It is the living conditions in these places that force refugees to use people smugglers to find safety somewhere else. Aid funding is running out. At the end of May the UNHCR said it had received promises for only 23 per cent of its anticipated budget for this year. This meant a funding gap of a staggering $4.53 billion. The World Food Program, which supports 1.3 million Syrians outside camps, has had to halve its assistance. World Food Program worker Diana El-Kassaby said the under-resourcing was so severe that Syrians talked of returning to the warzone. The situation is similar in Turkey, where 85 per cent of refugees live outside the camps and only 15 per cent of those receive any humanitarian aid support. Most Syrians cannot obtain permanent resettlement in surrounding countries. 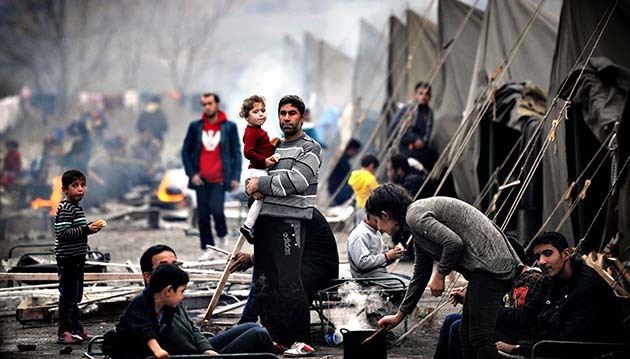 In Turkey asylum seekers can get temporary protection, but without the right to work. Politicians claim refugees should wait their turn for resettlement elsewhere. But as of August there were only 100,000 places available for third country resettlement—enough for less than 3 per cent of Syrian refugees. Abbott and now Turnbull have pointed to their “humanitarianism” in accepting 12,000 Syrians from refugee camps. But with the overwhelming majority of Syrian refugees still denied the chance of any third country resettlement, large numbers will still need to find their way to Europe, and even to Australia, to find safety. Abeer, living in Jordan says, “every country is closed in front of you.” Her brothers went to Algeria, where she says most visas are rejected. The family joined a group of 96 refugees attempting to cross the sea to Italy in August. When they reached the shore they were stopped by the Egyptian army, where the soldiers shot at the refugees and hit one of the man’s daughters. The soldiers refused to call an ambulance, left her to bleed, and she died in the early hours of the morning. The father was detained for over a week. After questioning he was released to bury his daughter. “My children tremble whenever they see soldiers,” the father explains. If countries like Australia, Europe and the US continue to refuse to assist the millions of refugees stranded in countries around Syria, more will attempt boat journeys across the Mediterranean using people smugglers. Instead of locking them in detention and throwing up more and more border controls, we need to demand they are welcomed, no matter which way they come.